This is an election year. Do your kids know about the United States’ election process? If not, they can learn in a fun product from Home School in the Woods. 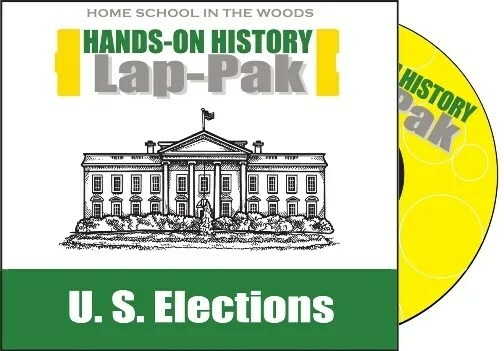 HISTORY Through the Ages Hands-on History Lap-Pak: U.S. 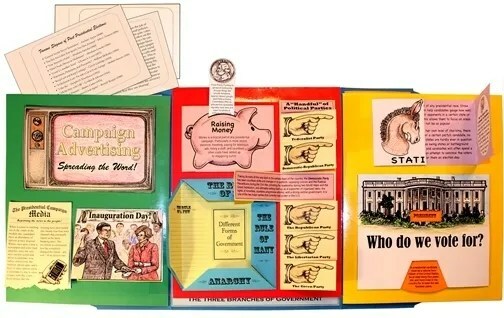 Elections is designed for grades 3 through 8 and is perfect for hands-on learners. Bookworm is in 6th grade, and he is a political junkie already. He’s watched every debate this year, and he’s taking a 4-H Civics class where they primarily discuss the election process. This lap-pak was right up his alley! Also included are several pages of text that explain the election process. This material can be used to help the student fill out parts of the lap-pak when necessary. For audio learners, this information is also available on audio. During our 4.5 week review period, Bookworm was able to complete 15 of the 21 activities included in the program. Most activities took us 15 to 45 minutes to complete. I printed out the pages and had Bookworm cut out and assembly each item. Some activities gave him the choice of doing his own research and writing it or of using text already written for him. Other activities required him to write the text. If we would have had another week or two, I think we could have completely finished the lap-book. Doesn’t it look amazing when it’s finished? However, if we weren’t doing this for a review, we likely would have taken a more leisurely pace and finished this in two to three months. I’m planning to keep this material to go through the course work again with PB & J Girl and Cuddle Bug four years from now during the next election. Bookworm loved that the projects were fun to make. It was fun to cut out the pieces and see them all together. He enjoyed making the electoral ballot and doing research on the candidates he was interested in. He also appreciated that there was reading packet to go along with the lap-book as well as some information about the election process printed on each activity. He thought this led to deeper learning. He also said the reading packet was interesting and provided a good overview of the election process. He recommended that students read the text pack early in the lap pack assembly process. The activities provide good reinforcement to the information booklet. I loved that this product utilized so many different learning styles. Kinesthetic learners could learn by assembling the items; auditory learners could listen to the reading; and visual learners could learn by reading the packet. Some projects were a bit complicated and difficult to put together. For instance, this one on Choosing the Candidate took us so long to figure out how to put together! It is 3-D, which is neat, but I don’t think the 3-D effect was worth the difficulty of putting it together. However, most of the rest of the projects, like this one on Raising Money were straightforward and not difficult to put together. Last year we reviewed another Home School in the Woods product, and at the time, I was a bit put off by all I had to buy–colored card stock paper, colored paper, double-sided tape, etc. However, this time I already had all of the supplies, so I didn’t mind one bit. Last time I think it was because I was a newbie and just overwhelmed by the process. Now that I’m used to it, I plan to buy more Home School in the Woods products for my kids. We love them!